At this time of year lamb is a favourite on the barbecue. This Easter I’m going to be keeping it simple and keeping it British. Roast lamb, seasoned with salt, pepper, rosemary and garlic. Cooked on the barbecue and accompanied with a homemade mint sauce. #1 Barbecue with the lid down. Whatever you’re barbecuing keeping the lid down is the key to success. It helps control the temperature inside the barbecue: as heat rises up from the bottom to the top of the barbecue the lid reflects it back down, circulating it around the food. This evenly cooks your food, helps it retain moisture for longer and locks in flavour. #2 Select the right cooking method. Depending on what you’re cooking you’ll need to set up your barbecue for either direct heat or indirect heat. Cooking something like roast lamb on the barbecue needs indirect heat where the fuel is either side of the food as it cooks above, whereas it’s best to grill foods like burgers using direct heat: with fuel directly under your meat. As a rule food that take 15 minutes or less are cooked over direct heat, while foods requiring 30 minutes or more should cook over indirect heat. For foods that require cooking for 15 to 30 minutes I recommend setting up your barbecue in the 50/50 method; where half of the fuel grate is set up for direct heat, and half indirect. This allows you to sear food over high heat to begin with, then move it over to indirect heat for the remaining time to ensure it’s cooked thoroughly, without burning. Choosing the right method for the food you’re cooking will ensure you get the most out of your barbecue experience. Use our handy guide to discover how to set up your barbecue for roasting lamb over indirect heat. Check the temperature of your food with a thermometer - it’s the only way to really know your food is cooked properly! If you follow this simple rule you’ll never over or undercook your food again. 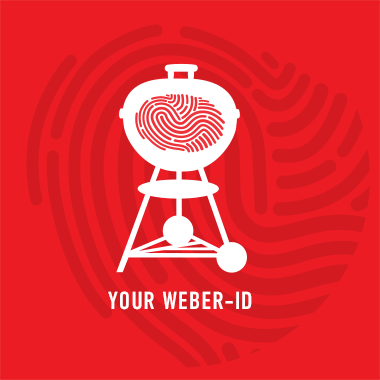 Weber’s iGrill is perfect for this, the app-connected thermometer allows you to monitor your food as it cooks: you simply tell it what you’re cooking, how you’d like it cooked and the iGrill will notify you on your phone when your food is ready. I like to roast my lamb to medium which is 60°C. For a guideline of other optimal temperatures you can view our cooking methods table. With these three tips you’ll be sure to impress your family and friends. Take a look at our fantastic roast lamb recipes at Weber.com, and if you’re looking to create your own mint sauce, I’ve shared my own recipe below. To begin, pick 30g of mint leaves holding back the stalks. Place the mint leaves in boiling water for a few seconds, then refresh in ice water. Drain the mint leaves and then finely chop. Add 145g caster sugar, 150ml water, 140ml cider vinegar and the mint stalks to a pan and bring to the boil, seasoning with a pinch of sea salt. Once boiling, remove from the heat and allow to cool. Once cool, discard the stalks and pour the liquid over the chopped mint leaves. Transfer to a jam jar and store in the fridge.